RENTON, Wash. One thing Pete Carroll learned in his nine years at Southern California was how to handle blowouts. Once the Trojans got rolling in the middle of the past decade, there were plenty of lopsided scores. So when he faced another blowout situation in the NFL on Sunday in Seattle's 58-0 rout against Arizona, Carroll felt his team handled the sometimes uneasy situation in proper fashion. "You either have a sense for it or you don't and I do. I'm tuned in," Carroll said. "I do know that it looks like the score just keeps going. This was a day yesterday where the ball just kept coming our way. It was a terrific day for us, but I understand, I get it." 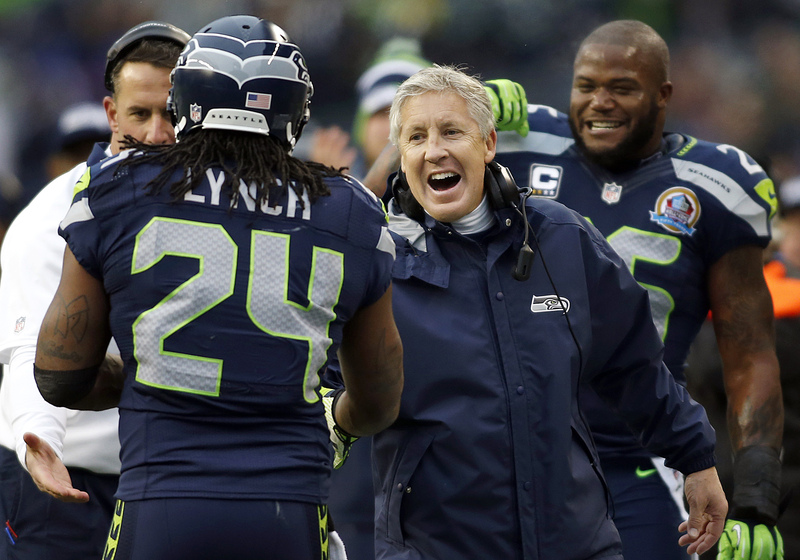 Seattle's romp was one of the biggest shutout victories in NFL history. According to STATS, LLC, with game information back to 1950, only New England (59-0 over Tennessee in 2009) and the Los Angeles Rams (59-0 over Atlanta in 1976) posted larger shutout wins. And Seattle's victory very easily could have been worse. The Seahawks (8-5) kicked short field goals twice in the third quarter and set a new franchise record for most points scored on Leon Washington's 3-yard touchdown run with 2:32 remaining. That late touchdown led to some criticism of Carroll on Monday. "Every situation we talked through. What you're trying to do, and here is probably the key, what you're trying to do is make first downs. You're trying to get first downs and keep the football, with the sensitivity of the situation," Carroll said. "You know you're going to run the football like crazy, which was awesome and we love to do that. We got a lot of things done yesterday and unfortunately on the other side that was a very hard day for those guys. I get it." One of Carroll's goals was to get backup quarterback Matt Flynn some significant playing time in the second half after spending the entire season on the bench behind Russell Wilson. For the final 25 minutes of the second half, Wilson got to be a spectator while Flynn played for the first time since Week 17 of last season with Green Bay. Flynn threw nine times during the span of four drives in the third and fourth quarters. Six of the nine passes were called "short" by the official game book, and the one curious decision was Flynn's throw to the end zone on fourth-and-23 from the Arizona 33 halfway through the fourth quarter. The pass fell incomplete. Seattle ran the ball 25 times in the second half. "It was the first time Matt had gotten in a game and we just didn't have an opportunity, and he needs to play, he needs to get ready because he's one play away from leading this football team," Carroll said. "In that instance and this is for years, I've always taken a look at what our special needs are. He needed to throw the ball a little bit. He threw the ball nine times. We threw the ball 22 times in the game. It was nothing. And if you noticed he threw a variety of things just so we could get some stuff on film. He got his feet wet, kind of." CBSSports.com's Will Brinson says it's ridiculous for anyone to accuse Carroll of running up the score. "Arizona simply wasn't able to stop Seattle's backups. That's not on Carroll, whose job isn't described as 'taking mercy on Ken Whisenhunt and the pitiful Cardinals,'" Brinson writes. "Nope, it's on the Cardinals for not being able to stop anything that Seattle did all day. And any criticism thrown at Carroll and Seattle for the way they played on Sunday is silly and reeks of people searching for a storyline that's not there." Now the challenge for Seattle is not letting the victory become a lingering hangover going to Toronto on Sunday to face the Buffalo Bills. It's a possible trap game for the Seahawks coming off such a huge home victory and with a home showdown against San Francisco that was flexed by the NFL on Monday to be the Sunday night game that week. If New England beats the 49ers this weekend, that game on Dec. 23 could be for the lead in the NFC West. But Carroll wasn't interested in entertaining thoughts of what lies a week ahead or the novelty of being the Sunday night game. "Yeah, whatever, it's moved back a little bit," Carroll said. "That's two weeks from now. We just stay in the hotel a little bit longer and then go play."